A rather basic yet highly addictive iPhone game, Hannes Jensen’s FallDown! hearkens back to old school arcade games where the objectives are simple and the levels seemingly endless. And just like old school games, the challenge in FallDown! doesn’t come from learning how to play the game, but in fine-tuning your abilities in order to keep up as the game progressively gets more difficult. Gameplay is straightforward and simple: tilt the device side to side to control the ball as it descends down the levels. Make sure the ball falls through the holes at each platform to continue your fall. The platforms change colors as you pass each level and the speed at which the platforms scroll up increases so make sure you keep falling through those gaps as quickly as possible. Failing to keep up results in getting ignominiously squished at the top of the screen. Get points by staying alive as long as possible. You may also collect bonus points or power-ups by rolling over the encircled question marks that appear at random on the platforms. There is also a Highscores board to track your progress. The graphics and sound are bare bones, just like the olden days of video gaming. 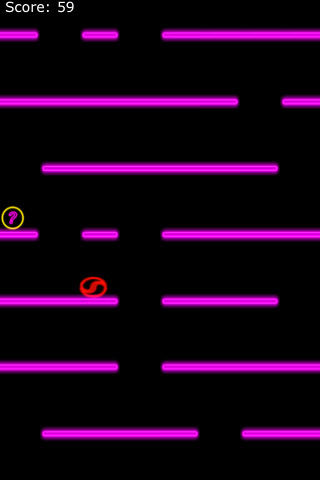 Against a black background, neon bright colored platforms light up the screen as the little red ball bounces through them. Sound effects are very 1970’s Atari-esque, beeping and chiming each time the ball bounces through a platform or rolls over a prize. Although it would be cute to have some fun background graphics going on while playing the game, I appreciate the nostalgia that FallDown! invokes: of when flashy graphics were unimportant to the actual fun and playability of a game. FallDown! is a great game that doesn’t require a lot of actual thinking but is highly entertaining nonetheless. I could play it forever, trying to fine-tune my ability to manipulate that little red ball through the various platforms to avoid getting squashed. Another great thing about FallDown! is that it’s free, but that also means ads will pop up at the top of the home page of the game. If this has the potential to annoy some of you, there is always the option to buy the game for $0.99. AppSafari review of FallDown! was written by Julie Guan on March 8th, 2011 and categorized under App Store, Free, Fun, Games, Physics Based. Page viewed 5604 times, 1 so far today. Need help on using these apps? Please read the Help Page.